Looking for trophies in San Jose and Santa Clara should be a fun experience. Designing custom sports awards can be a thrill as long as you hold onto a feeling of creativity. Think about your players and how their team makes you feel. If you can communicate that pride through your awards, you can show your team just how much they mean to you. Here are a few ways you can spice up your baseball sports awards. Hopefully, you and your baseball team had a fun season. Why should that stop when you are handing out sports awards? Look for creative templates for your awards, or print silly designs special to your team or league. There are a multitude of ways you can have fun and make sure your players enjoy themselves when you hand out the awards. There is no rule saying awards can only be given on off-white thick parchment or printed on a baseball-specific trophy. You might see if you can have your team mascot made into a trophy or etched onto a plaque. You could hand out bronzed baseball cleats, or have all the coaches and sponsors sign each player’s jersey. Design an award personal to your team, or better yet, personal to the player receiving the award. Go to your local trophy store for some helpful ideas, and don’t be afraid to think outside the box. This should be a special moment for your baseball players, so you should find some special ways to celebrate them. Everyone loves funny awards, so consider gearing your awards to each player’s individual triumph or snafu. “Player Most Likely to Watch Butterflies in the Outfield,” and “Player Who Improved the Most” are just a few examples of what could be very fun awards to hand out. 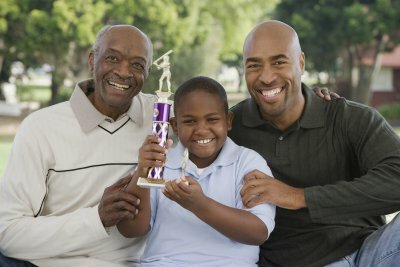 You can even include parents in your award-giving ceremony. Awards can go to the parent “Most Likely to Yell at an Umpire,” or “Parent with the Best Cookies.” The more personalized your custom awards are, the more appreciated the players and parents will feel.